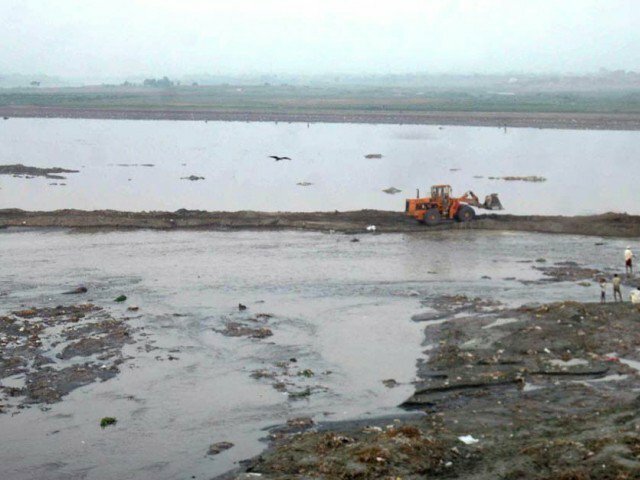 LAHORE: The heavily polluted water of River Ravi poses serious health and environmental hazards to its consumers as untreated domestic and industrial waste continue to be dumped unchecked into it. According to various studies conducted by the World Wild Fund (WWF) and other agencies, pollution in River Ravi has reached a level where not only is it unsafe for human consumption but it is also unsuitable for watering crops and for animals to drink from. Heavy metal contents, high arsenic level and sewage have been found in pumped groundwater due to pollution in Ravi and are causing diseases like typhoid, dysentery, cholera, hepatitis A and hepatitis C among citizens. Speaking with Pakistan Today, Punjab Environment Protection Department (EPD) Director Naseemur Rehman Shah said that the pollution level in River Ravi is constantly increasing as municipal waste from 11 main drains of the city and industrial waste from industrial estates in Kot Lakhpat, Ferozpur Road and Sundar are discharged without any treatment into it. Chemicals, food, plastic, poultry, paper, textile, leather, pesticides, paint and pharmaceuticals are some of the things that are dumped into the river by industries. Shah clarified, however, that not everything that flows from these industries into the river is dangerous. Processed water that is drained after chemical treatments in industries (such as tanneries) poses threat, and such industries are not very many, he said. He said that Punjab Chief Minister Shehbaz Sharif has formed a committee comprising finance, irrigation and housing secretaries to check pollution in Hudiara drain and the committee has held already met several times. He added that the committee has prepared PC-1 on the project and asked treatment plants to check pollution in River Ravi, which it also carries from India. Speaking about his department’s responsibilities, he said that the EPD is mainly a regulatory body. It does not receive funds for the construction of treatment plants. He said that it was the Water and Sanitation Agency’s (WASA) responsibility to treat municipal waste and to keep a check on it. He said that the EPD was currently engaged in a court case against WASA in environmental tribunals over pollution in River Ravi. He said that WASA itself faces financial constraints, requiring Rs 50 billion to clean River Ravi according to the agency’s managing director. He added that the EPD was also fighting cases against such industries as violated environmental laws. “EPD is like a law enforcement agency and fines industries and departments which violate the respective laws,” he said. WASA Deputy Managing Director Qadeer Khan told Pakistan Today that the agency was aware of the pollution level in Ravi and that it planned to install treatment plants in two phases to address it. Four plants are scheduled to be installed in the first phase – two between Railway Bridge and Motorway, one in Shad Bagh and one in Mehmood Booti area. He said that a Turkish firm had won the bid for their installation, and the project cost Rs 20-25 billion. He further said that WASA planned to get a loan of Rs 25-30 billion from the Asian Infrastructure Investment Bank to install 35 to 40 treatment plans in Babu Sabu near Thokar Niaz Baig. In 2012, Lahore High Court set up a commission to investigate and recommend solutions to the issue of rising water pollution in River Ravi. The commission reported between 1200 and 1400 small and big industrial units as dumping their chemical and medical waste into the river. It recommended imposing heavy fines on the responsible industries and building a bioremediation plant at Babu Sabu to clean contaminated water. The waters of River Ravi were allocated to India under the Indus Water Treaty in 1960 which was signed by General Ayub Khan and the then Indian Prime Minister Jawaharlal Nehru in Karachi. The first thing to do is to ban the use of disposable plastics unconditionally. Then the huge disposable market will disappear. On this occasion, companies will actively participate in development with eco-friendly materials. Prohibit the use of plastic in imported cargo from foreign countries. It will be an incentive to develop environmentally friendly materials in all countries.